It's September 15, the date I dread due to the fact that it's my birthday and I'm not getting any younger haha. So in spirit of my birthday I thought it would be fitting to review an anime during the year of my birth which is 1994. Now going through the archives of anime produced in 1994, not many choices were available compared to now. I wanted a short 12 episode series however not many of these presented itself. Out of the anime produced in 1994, Super Moon S was one of them. So I'd thought I would review the third instalment of the Sailor Moon franchise - good for me since I've already seen the anime when I was a kid so I just had to skim through the anime to refresh my memory. And yes I'm aware that the media I used for this post are from Sailor Stars, I don't care since it was hard finding decent media to use from the Sailor S era haha. The Sailor Moon series/ franchise is a cultural phenomenon, a piece of work that has solidified as a legend in the anime industry- just ask anyone if they have ever heard of Sailor Moon and I'm sure they will say yes. Even as a kid growing up I could feel the cultural impact of Sailor Moon since the girls in my class were chanting blurbs from whatever the sailor senshi said. And before people go crazy, I only watched Sailor Moon up to the Super S season since it was part of my morning cartoon ritual as a kid before school, it was right between Dragon Ball and Pokemon, so yeah I've only watched Sailor Moon in dub except for Stars. So if you've already seen the first two instalments of Sailor Moon, you can almost pretty much predict the formula the S season was going to take on. Having said that each season of Sailor Moon is about 40 or so episodes, since the first two seasons were relatively similar in terms of the cast, it's important that there should be cast changes so that the third season doesn't feel like a mimic of the first two with new villains. So far out of the three seasons, Sailor Moon S has to be the best out of the three. For this review I'm not going into the plot that much since it's relatively simple and holds similar affinity to the plot of previous season- it's basically sailor senshi verses the bad guys.... surprise, surprise? Now that I'm older and I look back at Sailor Moon, particularly the first three seasons, I don't think the first two were as good as the third. And that's mainly due to the cast, the first season was a force to reckon with but the R instalment was a step down from the first. I particularly disliked the whiny dynamic between Chibusa and Usagi; yes it was funny at times but for the most part it was repetitive to watch. So just when I thought Chibusu was dead in the water after R, she pops back up in S and that weird love-hate relationship between Usagi and her future daughter reignited. However even though I disliked Usagi and her odd affinity with Chibiusa, I was patiently waiting for all of the outer senshi to finally be introduced. Thankfully Sailor Uranus, Sailor Neptune, Sailor Pluto and Sailor Saturn were introduced - and no I'm not counting Sailor Pluto's tiny cameo in Sailor Moon R as a character introduction. The addition of these four senshi is the main reason why I enjoyed the third season a lot more. One thing I enjoyed seeing how overpowered the outer senshi were compared to the inner senshi, the inner senshi could not even hold a candle near how powerful they were. Another element I enjoyed about the cast additions was the friendship between Uranus and Neptune. I particularly liked how intelligent they were in comparison to Sailor Moon and the inner senshi and how the maturity of their relationship was the polar opposite between Chibusa and Usagi. In terms of animation, of course the third season takes the cake for the best out of the three since it's the 90s and honestly during those days each successive year in anime had huge improvements in animation. What I could not stand were those transformations and Sailor Moon's ultimate attack. It's nice to see the transformations every few episodes but not every episode. I mean is it really necessary to waste three minutes every episode to see them transform and on top of that see Usagi's heart attack skill take up two minutes of the anime every episode as well? It's ridiculous, I did not need to see Usagi spinning around and doing all those flips every episode- I mean was she practicing for Japan's female gymnastics team...lol? Music on the other hand was okay in my books. I could really careless about it but it didn't make a huge impact when I was watching Sailor Moon S. Although I will point out that I thought that the outer senshi theme song sounded epic and I enjoyed listening to it in the background whenever the outer senshi popped up. Overall very nice addition to the franchise. 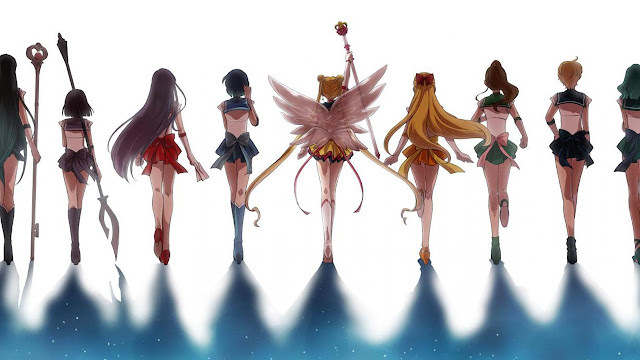 The S instalment was a breath of fresh air, the outer senshi brought a lot to the table and shook up the atmosphere of what the previous two seasons established. Although it's not my favourite season out of the entire franchise, it's defiantly up there. Maybe I'll rank all of the Sailor Moon seasons from worst to best in another post. Anyways thanks for reading, I hope you enjoyed it!